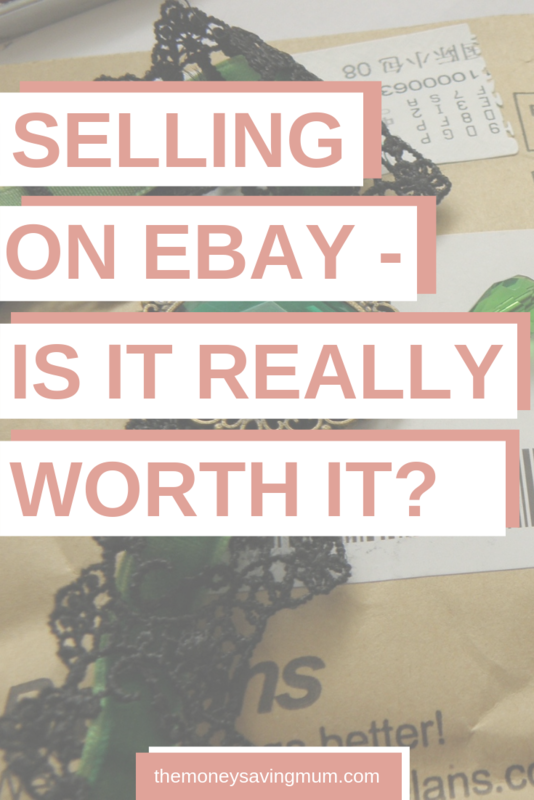 Selling on eBay is no doubt another income stream but is it really worth it? I personally would much rather send all my clothes to charity shop but that’s because I have no interest in spending as much time as I have done in the past; listing items on eBay, taking photographs, buying packaging, parcelling up and queuing in the Post Office. I’ve sold used shoes before as you may have seen me talk about in The Sun but that’s few and far between (I can’t say I go through shoes that often!) and although timely, the profit that can be made, in my opinion, did make it worth while. But for an old jumper or kids clothes that are just going to sell for £2/3 but take me half an hour each min to do all of the above.. I just don’t have that much spare time to invest in doing so. I only recently started selling on ebay and I’d love to hear more about pitfalls which I need to avoid. The first big issue I found is making sure I have enough packaging in the house. I need to know I’ve got a box ready to ship the item BEFORE I even list it on ebay, I have realized! The idea was that we would declutter, but in fact all the space under my desk is now full of boxes and bubble wrap that I’ve had to collect ready for selling. I find you get a much better price selling on eBay vs on local groups as your market is so much bigger. If you figure out postage costs and include this in the price, people feel they are getting a good deal. Often the larger, bulkier items you wouldn’t think to sell this way make the most. I’ve sold my expensive breast pump, a bottle prep machine and a cot. Clothes and smaller items I find to time consuming for the amount you’re likely to get back. However good quality pieces from Next, Biden and JojoMaman always do well. I used to sell on eBay. And then one day eBay contacted me saying my account had been hacked and they’d locked it. It was a complete nightmare to reclaim it and unlock it. To the point I had to set up a new account because I just couldn’t contact eBay properly. I lost over 500 positive feedbacks and it really put me off selling again. They take such high fees too. I stick to facebook market place now. I love ebay. When I have a more expensive item to sell, I like to wait for the £1 maximum selling fee offers that they do. You still have to pay PayPal fees but it saves lots of money on the ebay end of things! Posting and packaging are a pain! Both are time consuming and there are additional costs that can be miscalculated easily. I love selling on eBay, I feel terrible throwing things out so I get a lot of satisfaction knowing that my stuff is going on to someone who wants or needs it and will be used and loved again. Even if it’s for peanuts! I rarely go the effort now and prefer to sell in local Facebook groups. They’re quicker and easier to deal with – people come and pick up the items and there are no fees. Yes, occasionally you get someone wasting your time, but I’ve had less issues with this than I used to get on eBay. I sell a lot of unwanted items on eBay and yes it does bring extra cash in BUT I really hate packaging the items. You end up spending money on padded envelopes, bubble wrap, parcel tape etc. (depending on what you are selling) which eats into any profit & takes up so much time. Plus you have to then make the trip to send the item…& of course extra money if you print labels. It all just adds up too quick! You can list up to 20 items for free. After your free 20 items, each item you list costs £0.35. They often have ‘listing offers’ on like the one on at the time of writing this post whereby they will allow you to list up to 100 items and pay no more than £1 in selling fees. And don’t forget your PayPal fee’s either! There are lots of negative reviews of how the eBay Money Back Guarantee protects sellers but can potentially mean sellers are left out of pocket – protect yourself as a seller as much as you can by posting things recorded/signed for. Ensure you charge the correct amount of postage; so many people end up being out of pocket only realising when they take their parcel to the post office and realise it weighs more than they anticipated and won’t fit through a letter box! The best time to start a listing is in an evening and the best time for a listing to end is a Sunday night. I hope these tips and comments from fellow bloggers have helped you make a decision on whether or not selling on eBay is for you… I’m still not convinced! Next Post Mothers Day presents: what Mum really wants this Mothers day! I think it depends what you’re selling. My wife and I have made some good money over the years selling vintage items we’ve picked up on the cheap – made around £750 on an item of vintage fabric once – but have also wasted time selling stuff on auction that went for a pittance too.